VI Romans... in the snow! To close out the year, we have a new unit of (shivering) early Imperial Roman Legionaries. These fellows were 80% done back in June, when I put them on hold as they were surplus to what I needed for my Historicon games, and time was getting very tight for other troops that were needed. I finished them off this week, to slip in under the 2017 wire. Good choice wearing your cloaks in this weather - shades of Lake Trasimene! The rear rank has their Pila at the ready. Figures by Black Tree Design. I awoke to find a metaphorical proud Hidalgo tapping on my shoulder. "Señor, parece que ha omitido el regimiento de mi hermosa ciudad." "Aye carumba, Don Recuerdo, eso es verdad!" I actually painted this unit over a month ago, but had inadvertently mixed up the facing colors (black) with that of the Military Orders regiment (dark blue). I only recognized the mistake after I reviewed the photos. That required removing the respective standard bearers from their bases, repainting the facings in the correct colors to their flags, and re gluing them into the correct unit. At least black to dark blue and vice versa is a pretty easy paint conversion! The fine Brigade Games figures are once again Paul Hicks sculpts. Note the abbreviated bearskin on the Sapper. This unit looks like it means business! A couple of pre swap pictures - note the trim on the slung blankets. Made sense to have the black facings go with the black background of the Military Order shields... just incorrect! Seville is an ancient city, dating back to the 89th Century BC. It was the only inland port of significance in Spain, and grew rich during the height of trade with Spain's vast possessions in the New World. Located in Adalucia, the city is a mix of cathedral and Moorish palaces, where Flamenco dancing lives on in clubs. Definitely a Spanish city on my list to visit one day... just not in the middle of the summer! This year it is the Spanish army that assembles in preparation for a Christmas Day parade and Mass. Snow in the mountains in the distance, but none on the ground in their Mediterranean climate. Looks like the Militia are lagging behind arriving for the festivities! The village square is filling with troops. The Grenadiers have the place of honor in front of the Iglesia. Oranges are ready for the celebration of the Three Kings arrival in another 12 days. Those rag tag Militia! Hurry up, the priests are waiting to start! Angel's eye view of the village... Feliz Navidad! Written by Jester Joseph Hairston in 1956, the song has a Calypso beat. Belafonte, himself of Jamaican descent heard the song and asked for permission to record it; it became a #1 hit in the UK in 1957. I first heard the version by John Denver, which is excellent, but Belafonte captures the emotion of the song, the calypso beat and Caribbean English Lyrics so well. Curiously, I had occasion to meet Mr. Belafonte and his (second) wife in 1975. My friend Tom, who lived 2 doors down from me in my dorm at UConn, and I both played in the Marching Band all four years we were at the University, and thus we arrived a week early each Fall semester for pre-season practice. We were sitting in Tom's room on a hot afternoon and had the windows and door open to cut the heat, when Mr. and Mrs. Belafonte walked in. They introduced themselves and asked for some directions; they were moving their son into a room a few doors away on our floor. They were both lovely, charming, and utterly unpretentious. Unfortunately, I cannot say much good about his son, whom we seldom saw, and seemingly never went to class. Not surprisingly he flunked out after 1 semester. His roommate was Steve, a Sophomore defensive back on the football team, and a heck of a nice guy... not at all a typical jock type. Steve unfortunately had a concussion after almost every game, and long before the serious consequences of that were really appreciated, he had to stop playing by the end of that season. Anyway, the only way we knew that Steve's room mate was in was that he would always blast his favorite song on his high end stereo, "What a Difference a Day Makes", a song which I cannot stand to this day as a result, LOL! Evidently he went on to have a successful career in music production, but he was pretty much a waste of oxygen during his short time at UConn! Perhaps this year's song should have been "White Christmas"! View of the back yard just after the snow ended about 9 AM today. Annie and Zoe love to play in the fresh fallen snow! 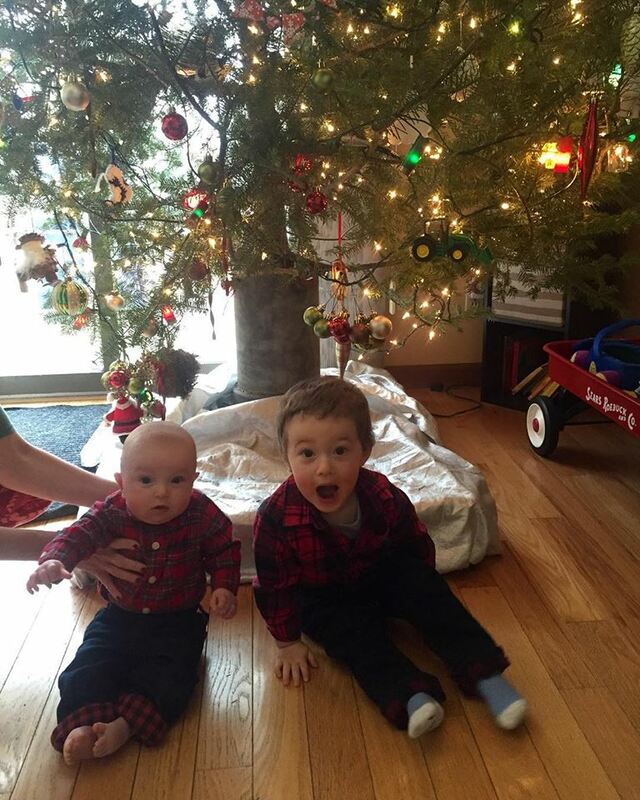 Best for last - Grandsons Owen (2) and Oliver (4 months). A unit of Spanish Grenadiers in their magnificent bearskins! Unfortunately the freezing rain today didn't allow me to take my pictures outside, which degrades their quality. I chose to paint up one stand each in the uniforms of six out of the seven Line regiments that I have painted so far. There will eventually be 10 Line regiments, so another, smaller unit of 4 stands of Granaderos will eventually be forthcoming as well! Thjis unit is composed of Front Rank figures. These were the first Spanish troops that I bought, circa 2010. I have been both looking forward to painting them, and dreading doing so ever since! The problem, of course, was the magnificent bags or "flammes" that hand down from the backs of their exceptionally tall fur caps (evidently actually made of seal fur in the case of the Spanish!). I knew there was no way I could really do justice to the intricate designs they more, which were individual to each regiment. Thus I decided to go with the "1 foot rule" - would they convey the effect at that distance, as opposed to close up inspection. 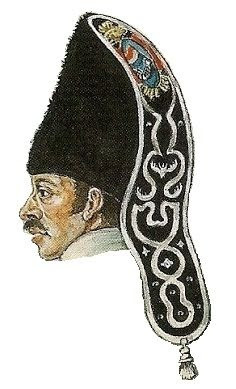 It seems the flammes in this era were in the facing color, with the lace work in the button color, with a provincial or other emblem at the top of the flamme (similar to those borne on the shields of the flags, presumably). I really couldn't do more than suggest those emblems, and then chose to do the rest of the flammes in a style similar to that seen on some examples, making 3 solid circles in the lace color, and then painting a smaller circle of the facing color within in to create a ring in the lace color. The unit caries an Ordenanza flag of the dark blue faced Military Order regiment. Note the drummer in Royal Livery and the fifer in a fanciful uniform. The other stands have facings in scarlet, crimson, black, green, or violet. Had some perfect weather for pictures on the 24th - what a difference the diffuse natural light of an overcast day makes! Contrast the richness f the colors with the earlier, indoor shots! The dry bushing on the bearskins, colpack, and plumes is now clearly visible. Much better view of those 'flammes' as well! I will have four more stands to do once I finish the rest of the Spanish Infantry. 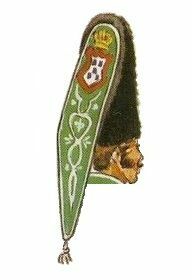 I found a great Pininterest site with a huge stockpile of Spanish Napoleonic Uniform images, and especially a great many images of the bearskins of various regiments. I have copied a few below. The Line Infantry Regiment of The Military Orders, seen it its 1808 uniform: dark blue turnbacks, cuffs, and shoulder straps, all piped white (I have omitted the piping except on the shoulder straps- just doesn't show much adjacent to the white jackets!). They should have white lapels piped dark blue, but again as that wouldn't show well, I made them solid blue. White metal buttons. This is the correct "Colonella" standard for this unit. The drummer wears the dark blue faced red Royal Livery. These are once again excellent Brigade Games figures sculpted by Paul Hicks. Some of the figures have blankets over their shoulders once again. Taking inspiration from fellow blogger Laurence at This Life in Lead, I have added a bit of colored stripes to the ends of them. Their flag is once again by Adolfo Ramos. The sapper figure on the command stand has a shorter version of the colored "bag" or "flamme" hanging down from the back of his bearskin, barely seen here. Regimiento de Infanteria de Linea de Voluntarios de Castilla (Line Infantry Regiment "Volunteers of Castile"), seen here in their 1805 uniform. Crimson lapels, cuffs, and shoulder tabs, piped white (which piping I have left off, except on the shoulder tab as inconspicuous abutting the white uniform), collars and turn-backs white piped crimson. The drummer is once again in the "Royal Livery", dark blue jacket with red facings, piped white. Flag is once again by Adolfo Ramos. 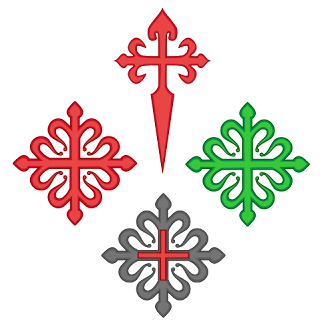 He doesn't do a flag for this particular regiment, so I have co-opted the Ordenanza of the Aragon regiment (sharp eyes will note the badge of Aragon in the corners, "Or, four palletts of gules", as opposed to that of Castile, "Gules, a Tower argent"). This unit is the first of several using Three Armies figures. They are very nice sculpts, if a bit heftier than the Brigade games figures, more of which will also be seen soon.